The Funeral Service of the Late Ms Natasha (Tash) Wood of Manjimup will take place at St Joseph's Catholic Church, 11 Ipsen St, MANJIMUP on WEDNESDAY (10.04.2019) commencing at 1pm. Following the Service, the cortege will proceed to Manjimup Lawn Cemetery, Crouch St, MANJIMUP. No flowers by request, donations in lieu to the National Breast Cancer Foundation. The years I spent with you were the best of my life. You were an amazing person. I will miss your beautiful smile. We got along so well because of your relaxed and easy going nature. You were so strong and never complained despite all you went through. You always had a positive outlook and wanted to get better. That was how you showed us how much you loved us. You brought up three lovely kids, which are a reflection of you. I promise I will carry on the love you gave them forever. Taken away from us far too soon. You will be forever in our hearts. Mum, you were taken away from us too soon. We will never forget you, you were the strongest woman we knew. It was very hard watching you go through what you did but you were very brave and never gave up. You kept fighting all the way. We will forever love you and miss you and keep all the memories in our hearts. Our beautiful daughter Natasha, you fought so hard to stay here with us all. Will be loved and missed forever. No words can explain the hole in our hearts. Life will never be the same, we were supposed to grow old and play with our grandkids together. Taa we love you forever. Shaz, Ash, Jay, Mika and Levi. Deepest sympathy to Tony, Shenae, Blake and Corey, Uncle Con and families. Rest peacefully Tash. Angela and family. Our deepest sympathy to Tony, Shenae, Blake and Corey. Natasha will be forever missed and remain in our hearts always. Condolences to the Giancola and Wood Families. Marco, Melena, and Damien Palermo. WOOD NATASHA Our heartfelt sympathy to Tony, Shenae, Blake, Corry, Bert, Francis, Sharon and families on the passing of Natasha. Rest peacefully now dear Tash. Aunty Karen, Uncle Tom, Michelle and Bradley. Sincere condolences to Tony, Shenae, Blake, Corey and families. A beautiful person taken too soon. Rest in peace. Stephen, Annamaria, Tom and James Anstey. All our love to Tony, Shenae, Blake, Corey and families. A wonderful lady who will be greatly missed. Rest in Peace. Antonio, Rosa and John Palermo. 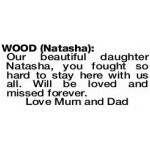 WOOD NATASHA Deepest sympathy to Tony, Shenae, Blake, Corey, Bert, Fran, Sharon and families on the sad passing of Tash. A beautiful person who will be sadly missed by all. WOOD NATASHA Deepest sympathy to Tony and family, Costanzo, and Maria, Dan and family, on the loss of Tash, she will always be remembered. WOOD NATASHA Sympathy to all of Natasha's family. Will remember the good times. RIP. Vicki and Bevan.